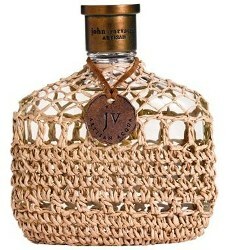 John Varvatos just released limited edition Artisan Acqua1 — a flanker to John Varvatos Artisan. I was intrigued for a couple of reasons: I liked original Artisan and can always be swayed (at least enough to sample a scent) when a cologne is described as “beach-y” (especially in cool, damp weather). Artisan Acqua is sporty and uncomplicated; it reminds me of men’s colognes (Made in America) from the 1960s and 1970s. Artisan Acqua almost went on my to-buy list for practical and sentimental reasons: 1: I enjoy it, it may not be around long, and I have no perfume like it in my collection; and, 2. (and more importantly) its later stages of development smell identical to a fragrance my father wore all through my childhood (I don’t remember the name, just the dark brown bottle capped with a brushed “gold” metal top). I talked myself out of buying Artisan Acqua because it smells like my father's cologne for just a short time, and it only comes in a huge size (125 ml Eau de Toilette)2 — but at $84, it’s a bargain. 2. Ed. note: A smaller, 75 ml size does exist but does not seem to be in US department stores. Sephora.com has a 2.5 oz for $64. Glad to read your review. I was on the fence with this one and your review helped me come to a new place on it. Thanks, Michael…but did you buy…or not?! No, but I think I will. To me it has a very laundry detergent smell and I happen to love very soapy scents. I was feeling like it was something I could easily live without since it didn’t provide much fodder for olfactory intellection and would therefore not be able to hold up its end of the conversation. It’s basically mindless nose candy, so to speak. But, as you hinted in your anecdote about your father, it’s more about affect than intellection, and it will probably bring me joy. Simple and perhaps fleeting joy, but joy nonetheless. Mj…I just had a delicious espresso…simple and fleeting joy. Ha! Your bottle of Artisan Acqua will give you lots of fun. Hi Kevin, you’ve made this one sound worth a sniff for me. I’m afraid I haven’t tried any of the Artisans except for the first, and that one I liked quite a bit. Just not enough to buy. I have to say, though, how much I love that bottle. Makes me think of the old-fashioned Italian restaurants with the raffia-wrapped bottles of Chianti on the tables. Ann…I really like all the bottles, too. I’ve had samples of this line since forever but have never been tempted to try it. Now I have to dig one out to see what the mini-fuss is all about! Haju…the original Artisan is the best of the lot…. I sniffed this today, I thought it was way too light..but I guess that was a point being a sportier scent..just too light, as well as another JV but I forgot which one. Not a huge fan of this line..but I am super picky with men’s scents. My husband loves the original one…I think it’s way too sweet.